Whether you call it a table tennis blade, racket, racquet, paddle or bat, one thing is certain – you can’t play the game of table tennis without these. There are a lot of ping pong rackets on the market to choose from. And models are designed so that some are better for beginners while others are better for more advanced players. While we’re focusing on the beginners and intermediate players here, we’ll give a few tips for the more advanced table tennis players. Below you can find our recommendations on the ping pong rackets that offer the best value for the money, as well as a guide and some reviews on our favorite table tennis bats. What Is A Table Tennis Racket? editor selections below based on value, quality and durability. **This page contains some affiliate links and GamingWeekender may be compensated if you make a purchase after clicking on the links. It’s easy to get overwhelmed by all of the options out there, but the truth is that beginners really just need a basic racket to play ping pong. You need a table tennis paddle that offers good all around control. So, nothing too slow and nothing too fast. The benefit of beginner table tennis bats is that they make is easy to control the ping pong ball as you learn all the different strokes. They also have a larger sweet spot, which means you’ll be more successful in getting the ball over the net. One thing to keep in mind that you get what you pay for. So, avoid the cheap ping pong rackets with a price tag under $10 because they won’t work as well. In fact, those really cheap racquets usually offer terrible control, which makes it difficult to properly learn the strokes and develop your technique. How much does a quality table tennis paddle for beginners cost? We suggest you expect to spend between $30 – $40 for a high quality ping pong blade for beginners. If you’re looking to improve your game, then it’s time to upgrade your racket to one that gives you even more control as a more skilled player. If you’re a serious table tennis player, then you could opt for a custom made blade where you pick your own rubber and wood paddle to get a completely customized experienced. However, for most people who are just recreational players, there’s no need to pay the premium cost of a custom racquet when you can just buy a good table tennis bat for intermediate players. You’ll need a blade that offers good control but is a bit faster than the beginner paddles. It’s important to not choose a racket that is too fast because it can lead to a lot of errors during game play if you haven’t yet fined tuned your techniques. You can identify good ping pong paddles for intermediate players by looking for all around paddles that have a high control rating. While we whole heartedly recommend all of the models listed up above, our editors want to share their reviews on a few of our favorite table tennis rackets. So, if you’re looking for a bit more info on some of the bats listed above, you’ll find our reviews below. If you’re looking for the best ping pong paddle under $50, then look no further cause this one fits that criteria with a price under $50 at Walmart. It has a flared handle that fits comfortably in your hand. One of the features that we really like is that it has shock dispersion technology, which means that a shock dispersion tube absorbs the vibrations and actually transfers that energy out, which results in you having more control, better speed and feel when playing with this paddle. Overall, this STIGA paddle offers a great value for the money because it is high quality, performs well during game play, and has an affordable, low price. That makes this our #1 pick when it comes to the best cheap ping pong paddle for beginners. If you’re looking for the best table tennis paddle for intermediate players, then look no further than this racket from STIGA. It’s the perfect choice for players who want to improve their game and techniques by moving up to a more serious racket. And, it has a great affordable price! How does it offer such amazing speed and spin ratings? It’s because of the carbon technology that’s integrated into the blade. It improves response and rigidity, which gives you that boost in power and speed. Another reason it has such a good speed rating is that this paddle features an ultra lightweight balsa wood center-ply, which helps to increase speed and reaction time. As you can see, this paddle has a lot to offer, which is why it gets our vote as the best table tennis racket for intermediate players. You’ll notice that we use all of the above terms on this page to describe this essential piece of table tennis gear. So, is there a difference? No, there is not. In fact, all of those terms refer to exactly the same piece of equipment. In the official table tennis rules and laws, it is referred to only as a “table tennis racket” but you can use whichever terminology that you prefer. You’ll also notice that different regions of the world use different terms, so you may just want to use whichever term is most common in your country. The first thing that you need to know is that these can be any size. There is no regulation rule on the size, weight or shape – only that it must be rigid, flat, and composed of at least 85% natural wood components. The most common size for a ping pong racket is around six inches across and 10 inches in length, including the handle. 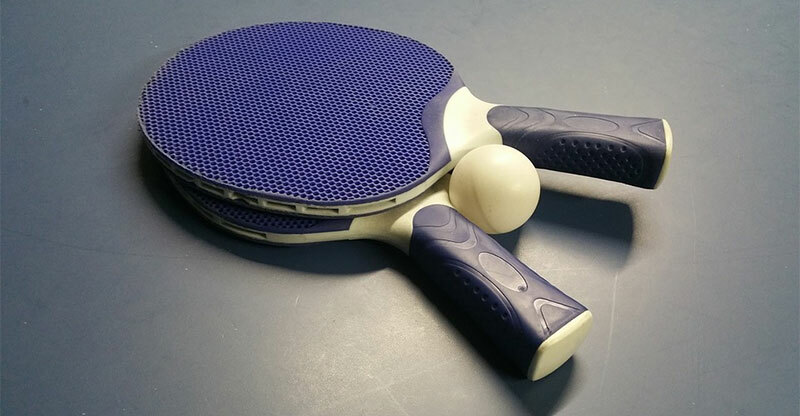 Rubber is attached to each side of the ping pong blade with a water-based glue. The penhold style blade is ideal for those players who use the penhold grip. If you’re not familiar with this grip, it is when you hold the handle of the racket between your thumb and forefinger. This is most commonly seen among Asian players. The Western style blade is ideal for players who use the Western, or shakehands, grip. This grip is when the handle is held in the palm of your hand, with the head snuggly fitting into the “V” area formed by your thumb and index finger. This is the most common among players. There are no rules or regulations related to handle type, so you are free to choose whichever you prefer. We suggest that you go with whatever style is most comfortable in your hand, as it varies from one player to the next. Personally, we prefer the flared handles and suggest it if you’re not sure where to start. Since July 1986, the official rules and regulations state that one side of the rack must be of black rubber and the other side red rubber. Of course, if you’re just playing for fun, then you can go with other colors that are available. Short pips are ideal for players with a fast blocking or counter hitting game, whereas long pips are suitable for a more defensive style of play. Since you want your racket to last you a while and perform well during game play, it is important that you take good care of it. The easiest way to do this is to always store your racket in a table tennis racket case or cover when it’s not in use. This protects it from sunlight, dirt or dust, and liquid spills. To ensure the most protection, don’t use a racket shaped case – instead, go with a square or rectangle option. To clean your racket, just use a damp cloth with plain water to gently remove any dirt or debris buildup from the racket’s rubbers. This should be done after each use. Let it air dry before putting it back in its case for storage. And don’t forget to clean the handles to remove any grime buildup from your sweaty hands!